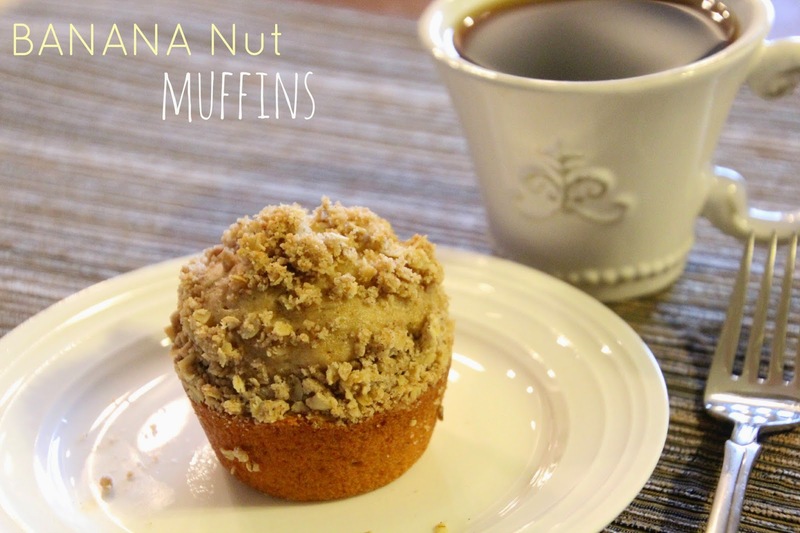 A few weeks ago my sisters came over for a sleep over and we decided to make homemade Banana Nut Muffins for a late Saturday morning breakfast. I found this recipe here and made a few minor changes for my girls. I hope you enjoy! 1. Preheat oven to 375°. Spray muffin pan with non-stick spray and set aside. 2. To prepare the muffins, mix the all-purpose flour and whole wheat flour until fully combined. Then mix in the next 4 ingredients (through salt) until fully combined and set aside. 3. Combine banana and next 4 ingredients (through egg) in a bowl; stir well. Add to flour mixture. Stir just until moistened; fold in walnuts. 4. Spoon batter into 12 muffin cups. To prepare streusel, combine oats and remaining ingredients in a small bowl. Blend with a pastry blender or a fork until mixture resembles coarse meal. Sprinkle streusel over batter. 5. Bake at 375° for 22 minutes or until a wooden pick inserted in center comes out clean. Then enjoy with a hot cup of coffee! I hope your week has been blessed and I hope your weekend is even better! Thanks for stopping by. Coming back next week for a new hair tutorial! Omgsh these look so yummy--the crumble top is calling my name! YUM! These look absolutely amazing! I'll have one now, please!